Provides sliding scale tax subsidies to individuals and families to limit their health premium expenditures. Credits are offered to ensure that premiums range from 1.5 percent of income at the lowest tier and 9.5 percent of income at the highest tier. Individuals with incomes between 133 percent & 400 percent ($24,352 – $73,240) of the Federal Poverty Level (FPL) will be eligible to purchase subsidized coverage. Cost-sharing assistance for individuals and families would also be available for those that qualify. 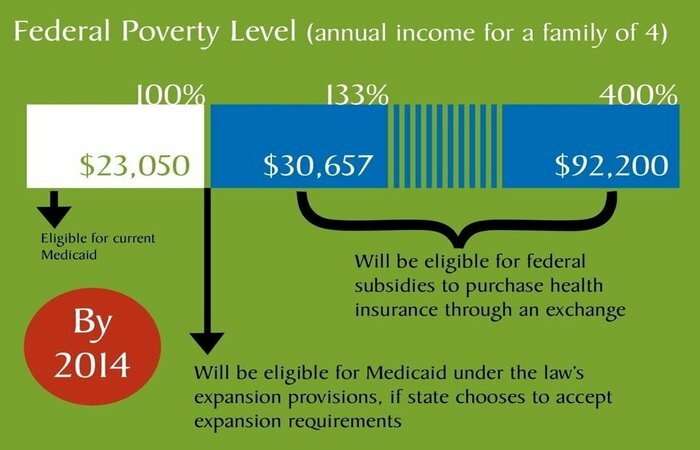 In 2013, Colorado passed legislation expanding Medicaid to individuals at 133 percent of the Federal Poverty Level ($14,856 for an individual or $30,657 for a family of four). The federal government will pay 100 percent of the coats of expansion until 2017 and 90 percent thereafter. Colorado’s share of the expansion costs will be funded by the provider fee on hospitals serving Medicaid patients. The Supreme Court ruled that the federal government could not take away states’ existing Medicaid funding if they refused to participate in the expansion. The federal government can, however, deny expansion funding to states that choose not to expand. Click here for an article outlining this decision.